Uranium is found most commonly in the form of its various oxide minerals. Martin Heinrich Klaproth first isolated a compound of uranium from one such mineral, pitcheblende, in 1789. He subsequently named the newly discovered element after the planet Uranus. Prior to Klaproth’s discovery, pitchblende had come into use as a means for coloring glass and ceramics. Uranium glass appears either yellow or green under white light and fluoresces bright green under ultraviolet light. Products colored with uranium oxides are only negligibly radioactive and therefore are considered harmless, but the use of uranium for this purpose declined significantly as a result of demand for uranium for other uses starting during the second World War. Uranium is the second heaviest of the naturally occurring elements, with the heaviest being plutonium. All natural isotopes of uranium are unstable, but most decay slowly, and despite the element’s association with dangerous applications of radioactivity, it is itself only weakly radioactive. In nature the element is found as uranium-238 (~99.3%) and uranium-235 (~0.7%), the latter of which can be induced to undergo nuclear fission and sustain a fission chain reaction in a nuclear reactor or nuclear weapon. Uranium is also notable for its high density--higher than lead, and surpassed by only a few elements. Radioactivity itself was discovered through the study of uranium salts by Henri Becquerel and his colleagues Marie and Pierre Curie. The discovery of this phenomenon was made in 1896, and the trio was awarded the Nobel Prize for their discovery in 1903.The low energy radioactivity emitted from uranium under ordinary circumstances dictates that the element only presents significant hazard to life when it is brought inside the body through ingestion, inhalation, or skin absorption of contaminated materials. Uranium toxicity in these cases is caused both by low-level but persistent radiation and by the chemical toxic effects of the metal, which are similar to but milder than those caused by other heavy metals. The most familiar use for uranium exploits the fissile nature of uranium-235 to produce massive amounts of energy, either for destruction, as in nuclear weapons, or for power generation, as in nuclear energy. Research on the possibility of sustained nuclear fission began in 1934 under the leadership of Enrico Fermi, and the first artificial self-sustained nuclear chain reaction was achieved in 1942 as part of the Manhattan project. As only the rarer uranium isotope uranium-235, and not the more common uranium-238, can sustain fission, use of uranium for fission reactions requires an enrichment process, in which uranium isotopes in the form of uranium hexafluoride are separated by weight using high-powered centrifuges, ultimately producing uranium compounds enriched in uranium-235. Uranium may be enriched to varying degrees depending on the intended use: nuclear power plants typically use either natural uranium or uranium with less than a 20% concentration of uranium-235. Weapons grade uranium is highly enriched, containing at least 20% and often much higher concentrations uranium-235. Fast neutron reactors and naval reactors also require highly enriched uranium for operation. Early nuclear weapons operated solely based on nuclear fission, and used highly enriched uranium as the primary fuel. Later nuclear weapon designs, known as thermonuclear weapons, used a primary fission reaction to set off a secondary fusion reaction between isotopes of hydrogen. The primary reaction may still use uranium, but more commonly uses plutonium-239, which itself is produced through the bombardment of uranium-238 with neutrons in a nuclear reactor. The product left over following uranium enrichment is termed depleted uranium: uranium with higher lower concentrations of the fissile uranium-235 than are typically found in nature. Depleted uranium metal is used widely in military applications as both armor and munitions, both applications that benefit from the high density of the material. In civilian applications, depleted uranium is used primarily for shielding from high-energy radiation sources, such as the iridium-192 used in industrial radiography. Compound forms of depleted uranium are often used in laboratory settings, most often in stains for use in electron microscopy. Uranium is obtained commercially from the extraction and processing of uranium-bearing minerals such as uraninite. The ores are processed through grinding to a uniform particle size and then treating with acid to chemically leach the uranium from the ore. The material ultimately produced by this process is the standard form of natural uranium sold on the market, a powdered form of uranium oxide known as “yellowcake”. Where enriched uranium is required, yellowcake is treated with various chemicals to produce uranium hexafluoride, known as “hex” in the nuclear industry. Uranium hexafluoride is highly toxic and reactive, and because it is corrosive to most metals is hazardous to store, but is the primary raw material for all uranium enrichment techniques. Uranium in its depleted and unenriched forms has numerous commercial applications due to its great density and its bright yellow-green color in glass and ceramics. Because of its great density it has found military applications in armor piercing armaments and in protective shielding. Uranyl nitrate and uranyl acetate are used in medical and analytical laboratories. Uranium is a Block F, Group 3, Period 7 element. The number of electrons in each of Uranium's shells is 2, 8, 18, 32, 21, 9, 2 and its electron configuration is [Rn] 5f3 6d1 7s2. The uranium atom has a radius of 138.5.pm and its Van der Waals radius is 186.pm. In its elemental form, CAS 7440-61-1, uranium has a silvery gray metallic appearance. 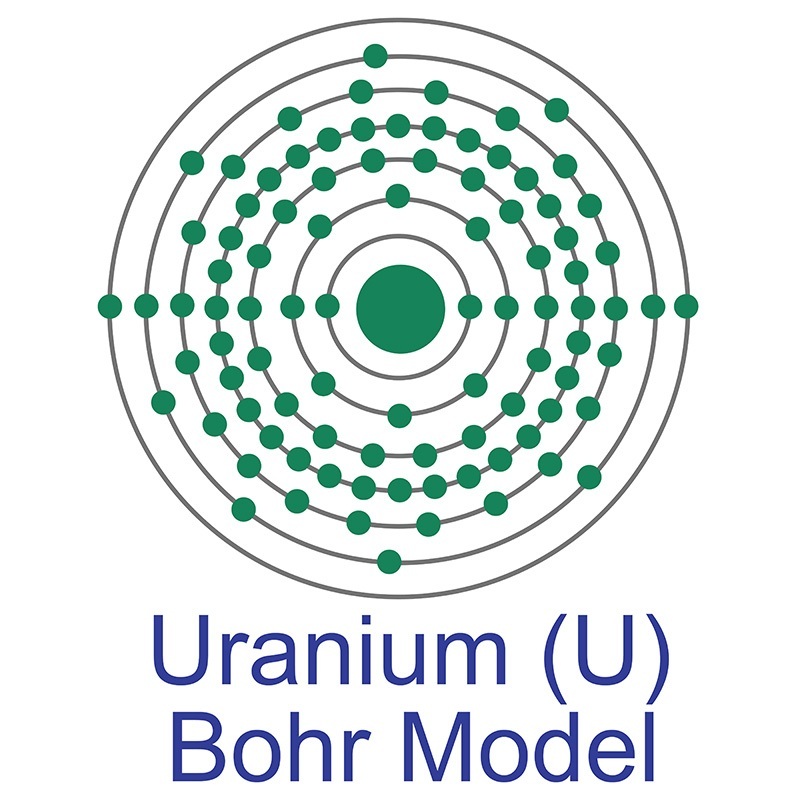 Uranium was discovered by Martin Heinrich Klaproth in 1789. It was first isolated by Eugène-Melchior Péligot in 1841. The name Uranium originates from the planet Uranus. Uranium information, including technical data, properties, and other useful facts are specified below. Scientific facts such as the atomic structure, ionization energy, abundance on Earth, conductivity, and thermal properties are included. Uranium is harmful both through its radioactive nature and its chemical toxicity. The below information applies to elemental (metallic) Uranium. Uranium has two primordial isotopes with long half-lives: 235U and 238U. Both of these are found in the earth's crust. It has no stable isotopes.